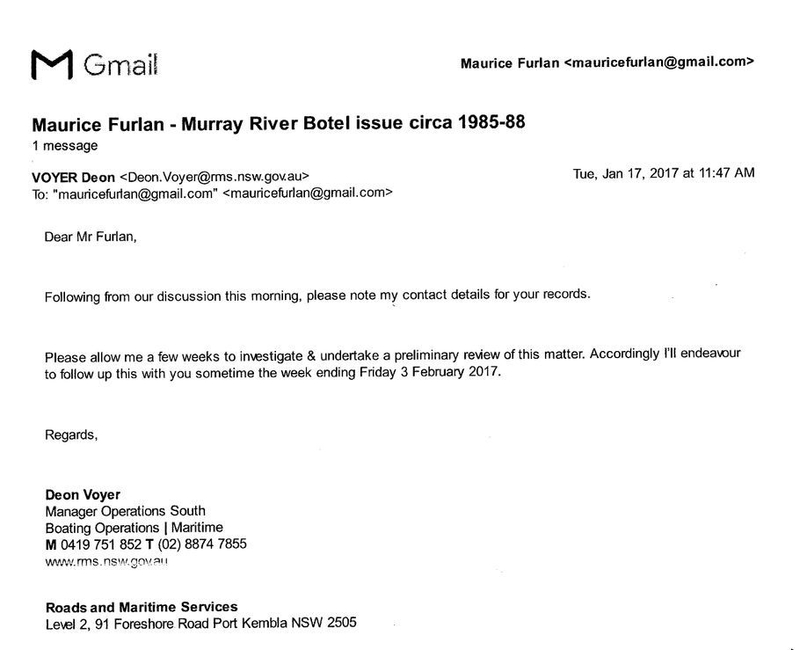 The dates (1985-1988) on this email from the current Maritime Regional Manager revealed that files had been tampered with. The NOTICE and CONFISCATION took place in 1990. Therefore it can be concluded that either the information was destroyed or it was never officially recorded. You would know that your father Bruce, was once NSW Transport and Maritime Minister. At that time, my wife Karen and I wanted to join many others living peaceful lives aboard houseboats on the Murray River. MSB regulations controlled the living on vessels. We also wanted to make a living from our lifestyle. The NSW Maritime Services Board (MSB) were obliged to promote commercial marine development. We applied for commercial marine license to construct and sell houseboats at our mooring (WS012) on the Victorian riverbank at Koondrook. We planned to build two types of houseboats and to sell them if the idea failed. We also applied for a separate commercial licence to operate a novel “Botel Marina Project”. The NSW Wakool Council invited us to lodge a formal development application. They agreed in principle to a site adjoining a caravan park and poker machine club. Crown Lands were joint applicants to the application. Together, they reneged in their support and then conspired to destroy the houseboats with the collaboration of maritime officials. Over time, the Internet grew and not long ago it revealed the secret involvement of WA town Planners. The NSW Environment and Planning Department paid them to entrap us and financially destroy the project. Much of the fraud is recorded in Hansard Assembly 3 188 of 10 November 1988 and on the Smithson Planning website. I spoke with your father recently and he did not recall the matter. I sent him a number of documents but he has ignored me. I hope to meet with you and your father to make my accusations. I trust that if he cannot deny them; then you will stand by me in having the matter finally remedied.